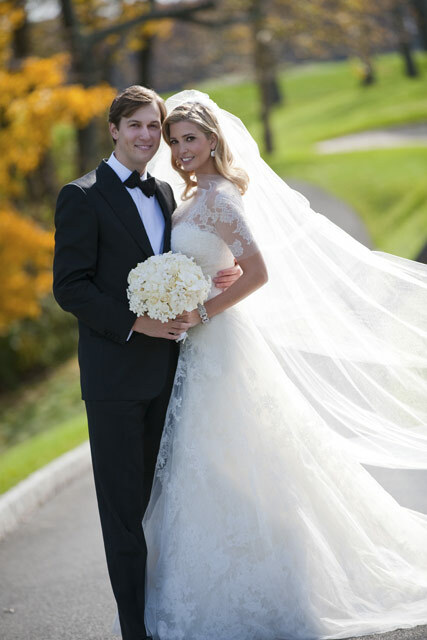 Yesterday we brought you the news that Ivanka Trump had wed her publisher fiancé Jared Kushner, but today we bring you the gorgeous wedding photos! The blushing bride looked simply stunning as she posed for snaps with her new hubbie, in a classic Vera Wang gown inspired by Grace Kelly, teamed with diamonds from her own fine-jewellery collection. The grand ceremony was held at the Trump National Golf Club and surrounding grounds in New Jersey, to which 500 guests were invited – including Russell Crowe, Natalie Portman, Barbara Walters, Rudy Guilliani and US television royalty, Regis Philbin. The happy couple spent most of the night dancing, and are rumoured to be honeymooning in Africa. Oh we do love a good wedding! CHECK OUT OUR GALLERY OF STYLISH REAL LIFE BRIDES!